Heinrich Heine’s chillingly prophetic statement that where books had been burnt people would eventually be too is now engraved on the “Bibliotek” memorial in the Bebelplatz square on the Unter den Linden boulevard in Berlin. 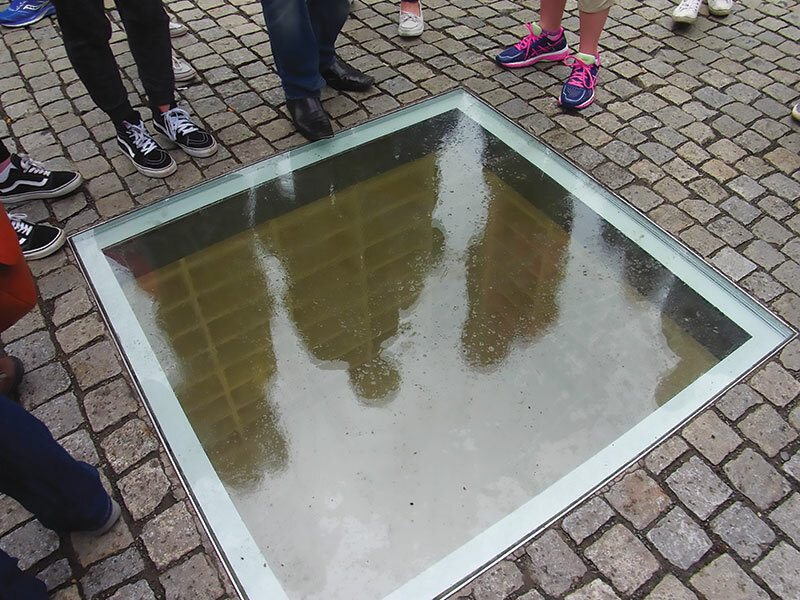 This memorial commemorates the infamous May 10, 1933 book burning of more than 25,000 volumes there, which was presided over by the most intellectual of the Nazi leaders, Dr. Joseph Goebbels. Authors whose books were thrown into the flames by university students included such “enemies of the German spirit” as Karl Marx, Albert Einstein, Thomas Mann, and, of course, Heine himself. The memorial, designed by the Israeli artist Micha Ullman, derives its considerable power from its mute depiction of library shelves emptied of their books. Heine’s remark is a powerful and oft-quoted warning about the connection between barbarism and human evil, but its literary context has been almost entirely forgotten. 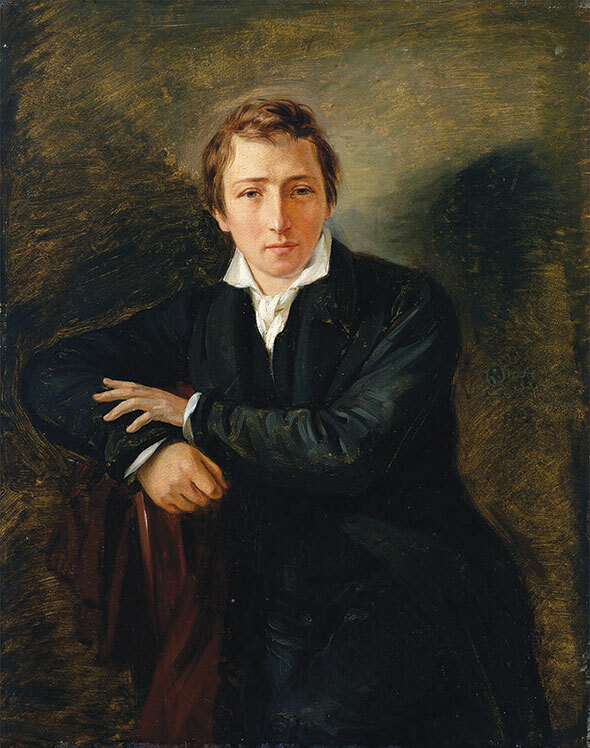 Thus, in a play aimed at a German, mainly Christian, audience, Heinrich Heine, born to a Jewish family in Düsseldorf, criticizes Christian Spain for the burning of the Qur’an. Modern German poets did occasionally show admiration for Islamic culture, as, for instance, did Goethe in his West-Eastern Divan, but Heine’s lamentation stands out. It is emblematic not only of his empathy and his unusual insight into human affairs, but also, perhaps especially, of his conflicted identity as one of the first German Jewish intellectuals to enter the Republic of Letters. Heine wrote the play at a crucial period of his personal and intellectual development. He was attending Hegel’s lectures on political philosophy at Berlin University, and he had just helped to found the Verein für Kultur und Wissenschaft der Juden (Society for Jewish Culture and Science) along with a small but extraordinary group of fellow Jewish students. The Verein marked the first attempt to present Judaism to modern, emancipated Jews as well as to the general public not merely as a religion, but as a historically anchored culture that was worthy of study and respect, even by those who did not follow its traditional precepts. The statutes of the group were drafted by Leopold Zunz, who would go on to essentially found Wissenschaft des Judentums (the Science of Judaism, that is, modern academic Jewish studies), Heine’s close friend Moses Moser, and another friend, Eduard Gans. Gans was Hegel’s disciple and assistant, and also one of the first Jewish scholars to be appointed, albeit on a temporary basis, to a teaching position at Berlin University, which was the first modern university in Germany without a medieval ecclesiastical background. Although, in the years following the end of the Napoleonic wars and the 1815 Congress of Vienna, Heine and his Jewish friends were able to attend university and aspire to careers as German writers and scholars, these years also saw the emergence of virulent modern German nationalism. The torchbearers of this movement were the student fraternities (Burschenschaften), which had transformed themselves during the anti-Napoleonic wars from rowdy but insignificant medieval corporations into the spearheads of a national movement. The fraternities enacted new, nationalist statutes that explicitly excluded “foreigners,” by which were meant not only French students but also Jews, who were suspected of supporting the emancipatory message of the French Revolution. In 1817, under the guise of celebrating the 300th anniversary of Martin Luther’s “95 Theses,” the fraternities called for a major pilgrimage to the Wartburg fortress in Thuringia, where Luther had once found refuge from his Catholic pursuers. The authorities, who regarded the young nationalist students with suspicion, could not of course ban an event celebrating the birth of Protestantism, but the message of the pilgrimage was clearly modern and political. The Wartburg Festival, as it was called, was one of the first political mass demonstrations of the 19th century. Under the banner “Honor, Liberty, and Fatherland,” more than 500 students made the trek to Wartburg Castle. The festive procession culminated in a torchlight parade, with speeches by a number of student leaders and university professors—and a celebratory book burning. The first volume to be thrown into the flames was the Napoleonic Code, which had been introduced in some German states during the brief period of French hegemony. The students and their teachers saw the civil code as a symbol not only of foreign occupation, but also of the universalistic ideas of the Enlightenment and hence something antinational and anti-German. Of course, these were precisely the ideas that underwrote the equal rights that had been granted to Jews in the Rhineland and other German areas under French rule or influence. 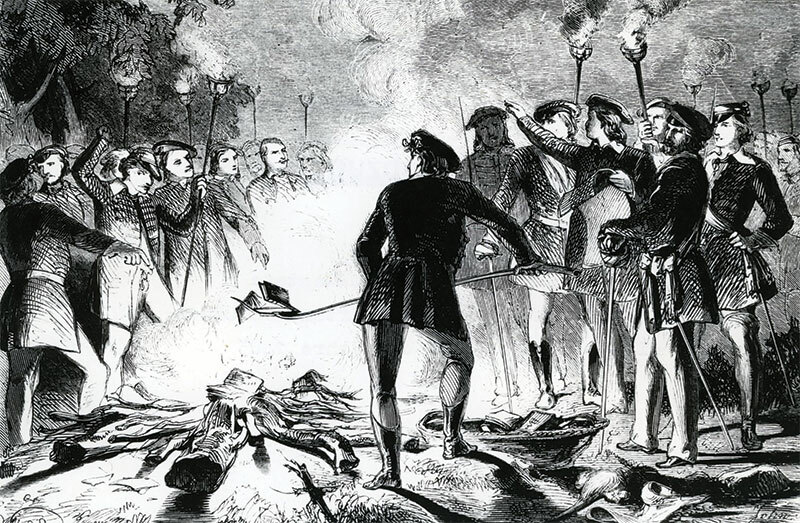 Others books consigned to the flames included works by writers and poets who had opposed German unification; among them were the books of the poet August von Kotzebue, who was murdered a short time after the Wartburg Festival by a radical nationalist student, Karl Sand. After his execution in 1820, Sand was regarded as a martyr for the nationalist cause by the Burschenschaften. Another one of the authors whose books were condemned to the flames was Saul Ascher, a German Jewish philosopher and publicist who is today almost totally forgotten. Born as Saul ben Anschel Jaffe to a Berlin Jewish banking family, he was one of the first Jewish students to receive a doctorate. By the second decade of the 19th century Ascher was famous throughout Germany for a series of popular publications in which he supported the ideas of the French Revolution and called for full civic rights for Jews everywhere. Ascher was close to the founders of the Verein and particularly to Heine, who wrote about him several times and visited Ascher on his deathbed in 1822, shortly before the publication of Almansor. What made Ascher especially loathsome to the nationalist students was a book he published in 1815 under the title Die Germanomanie. Appearing at the very moment of the Germans’ victory in what was then called the War of Liberation Against France, Ascher sharply criticized the nationalist and xenophobic aspects of the Burschenschaften, as well as of the new and popular gymnastic movement of Friedrich Ludwig Jahn, which had become a mobilizing force for volunteers in the war against France. In Ascher’s eyes, the legitimate German patriotism of the national movement was being perverted into a radical hatred of foreigners and Jews, as evidenced by the gymnastic movement’s rejection of Jews as “lacking honor”—they were not satisfaktionsfähig, that is, worthy of carrying a sword, in the quasi-knightly language of these nationalist groups. Among the reasons the Wartburg Festival was greeted warmly in academic circles was the fact that one of the main speakers at the book burning was a respected philosopher, Jakob Friedrich Fries. A Kantian, who had just moved from Heidelberg to Jena, Fries was a prolific writer on logic, mathematics, anthropology, and psychology (and also, as it happened, the assassin Karl Sand’s teacher). In 1816 Fries had published an essay “Über die Gefährdung des Wohlstandes und Charakters der Deutschen durch die Juden” (On the Danger to the Welfare and Character of the Germans by the Jews), in which he argued that the Jews endangered the spirit and future of the German nation. He went on to suggest a number of steps that the German states should adopt against this danger. Among them were a total ban on Jewish immigration to Germany, encouraging Jewish emigration from Germany, a ban on intermarriage between Jews and Christians, prohibiting Christian servants (and especially maids) from working in Jewish households, and last, and perhaps most shocking to Jews who believed that they had entered German civil society and even the European Republic of Letters, making Jews wear a distinctive mark on their clothes. The similarity to the 1935 Nuremberg Laws is stunning, as is the resemblance between the 1817 Wartburg Festival and the 1933 book burning. Illuminated by torches, at Wartburg things were said and done befitting the Middle Ages. . . . A narrow-minded Teutonic spirit reigned there, which spoke loftily of love and faith, but was anchored in a hate of foreigners and their religion. Out of their ignorance the participants could not imagine anything better than burning books. Less than two years after the Wartburg Festival, the so-called Hep Hep Riots (named after the rallying cry of the rioters), which were the first anti-Jewish pogroms in modern Europe, swept through dozens of German cities. In these riots, which lasted sporadically for almost three months, Jews and Jewish shops were attacked, often by German students. The shock among German Jews was enormous. Indeed, the reaction among Heine’s circle was precisely the setting up of the Verein für Kultur und Wissenschaft der Juden, which they saw as an attempt to counteract resurgent anti-Jewish feeling among the German learned classes, as well as to encourage pure historical research. Obviously, there was an intrinsic tension between the Verein’s two aims, and it should not come as a surprise that the Verein did not last long, its founders and members going their separate ways. Others, like Eduard Gans, found themselves facing difficult choices. He was without doubt Hegel’s most outstanding student, and it was the great philosopher himself who secured his temporary appointment at Berlin University. But when the issue of a tenure appointment as full professor (Ordinarius) came up, his Jewishness was a stumbling block. Under Prussian law, university professors were civil servants (Beamte) and had to belong to a Christian denomination. Despite Hegel’s solicitations and the efforts of Gans’s own father, who as a banker was the financial adviser of some high-ranking officials, the law could not be bent. After many hesitations, in 1825 Gans converted to the Lutheran Church and was appointed to the post of professor at Berlin University. When Hegel died in 1831, he succeeded him in his prestigious chair of philosophy and became the editor of the first edition of Hegel’s complete works. That same cross which you detested . . .
As for the play Almansor, it was put on stage on August 23, 1823, at a provincial theater in Braunschweig. The performance caused a tumult, and after the last scene a small riot broke out, in which voices were heard shouting that someone should put an end to “this nonsense by the Jew Heine.” There never was a repeat performance, but Almansor’s famous reply to Hassan, “Where they have burned books, they will end up burning people,” retains its terrible resonance. Shlomo Avineri teaches political science at the Hebrew University of Jerusalem and is a member of the Israel Academy of Sciences and Humanities. He is the former director-general of the Israeli Foreign Ministry. He is the author of numerous books, including Herzl’s Vision: Theodor Herzl and the Foundation of the Jewish State (BlueBridge). Jews, Muslims, and Christians all revere Abraham. But is it the same Abraham? 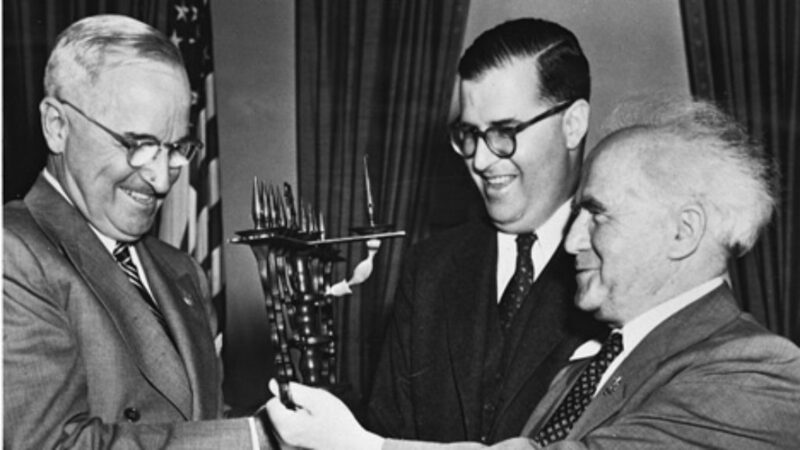 Ross shows how the U.S.-Israel relationship has survived, and even thrived, since 1948 despite the radically different approaches taken by successive presidents.